The article is here. It is so good, in my opinion, that I can’t just give a quote from it. Indeed, fact is: with all due respect for the publishers, librarians, even for the ISI bean-counters, science is primarily made by researchers, who are the most competent for taking decisions for their good. Only that we have forgot this and instead we rely on others, less competent, for reasons we are also to blame for. This is good to recognize, not for us to feel guilty about, but to take steps for taking back our power of decision. Science is not a commercial activity, it does not feel good on the long term by being managed for attaining short-sighted goals. We are not the milk-providing cow of others, who take our raw product and packages it in fancy looking clothes, for the sake of selling it. On the other side, we have to find the courage of taking decisions for ourselves. To rely on “objective measures”, which are nothing else than means to avoid accountability, is to be afraid to take decisions. This kind of change has to happen starting from the researchers involved in management of research. Because, in fact, the enemy is not quite “us”, but if this kind of change, which is for the benefit of science, is opposed by their inertia, then it is starting to look as being “them”. Greg Martin, a number theorist at UBC (the University of British Columbia in Vancouver) doesn’t think so, so he has decided to resign from the editorial board of Elsevier’s Journal of Number Theory. Should all existing editorial boards revolt and all journals be electronic? Or perhaps should we move to “pay-for-publishing” model? Or even “crowd source refereeing”? Well, now that the issue a bit cooled down, I think I figured out exactly what should happen to math journals. Be patient – a long explanation is coming below. DORA, in my opinion, can be considered a positive outcome of this movement (and of course, the Cost of Knowledge is only a drop in the sea of initiatives towards updating the research communication system from the medieval age to the present one). Let’s not be more pessimistic than we should. Is the stumbling block the publisher, or is it in the academic realm? Where is the weak link of this Research Banana Republic? Could it be in the entrenched opinions of a majority of researchers, based on a self-referential definition of academic impact which is built around “objective” measures? I took a look at the wikipedia page on Thompson ISI, to see what an open, non-partisan source is writing about it. This database allows a researcher to identify which articles have been cited most frequently, and who has cited them. The database not only provides an objective measure of the academic impact of the papers indexed in it, but also increases their impact by making them more visible and providing them with a quality label. There is some evidence suggesting that appearing in this database can double the number of citations received by a given paper. An “objective measure of the academic impact”? What is the evidence which backs this PR on wikipedia? The ISI was founded in the 1960 and “there is some evidence suggesting that appearing in this database can double the number of citations received by a given paper” in ONE article from 2013? The previous post on this subject, New discussion on UD (updated) , has lots of interesting comments. It has become difficult to make sense of the various proposals concerning the UD algorithm, therefore I made this new post which shall serve first as a place for new discussions, then it will be updated. but anybody which has something coherent to communicate is welcome to make a proposal which will blow our minds. Make your respective proposals as detailed as you wish, take your time to make them convincing and then, if you agree, of course, we shall make feature posts here with each of them, in order to become easier to follow the different threads. it is a mathematical breakthrough, though not a CS or math technical one (i.e. does not need the latest edge CS or math research in order to make sense of it, but it’s a beautiful idea). Almost finished, but I have to explain a bit my attitude about UD. I am thorn between my curiosity about this, explained in other posts (for example by it’s partial overlap with the goals of Digital Materialization), and the fact that I don’t want this blog to be absorbed into this subject only. I have my ideas concerning a possible UD algorithm, especially from a math viewpoint, but unless I produce a program, I can’t know if I’m right or wrong (and I am not willing to try yet, because I am sympathetic with the underdog Dell and also because it would take me at least several months to get off the rust from my programming brain and I am not yet willing to spent real research time on this). Suppose I’m wrong, therefore, and let’s try to find it in a collaborative, open way. If we succeed then I would be very happy, in particular because it would get out of my mind. Up to date, this is the most comprehensive introduction to graphic lambda calculus. Is available as arxiv:1305.5786. It does not contain all the material on the subject, but it is, I hope, a fair exposition of what you can do with it. See also the tutorial page on graphic lambda calculus on this blog. it is the visual language appropriated for giving a rigorous formulation of the constructions done in Computing with space. If you have comments or corrections to make, or peer-reviews, let me know! For the moment I can’t stand to look at it, I have to detach a bit, but it would surely benefit from a fresh eye. What is an author buying from a Gold OA publisher? 1. Is the author a customer of a Gold OA publisher? 2. What is the author paying for, as a customer? I think the author pays for the peer-review service. 3. What offers the Gold OA publisher for the money? – +Mike Taylor says that the Gold OA publisher offer the service of assembling an editorial board, but who wants to buy an editorial board? No, the authors pays for the peer-review process, which is managed by the editorial board, true, which is assembled by the publisher. So the end-product is the peer-review and the author pays for that. – almost 100% automated services, like formatting, citation-web services, hosting the article are very low value services today. However, it might be argued that the Gold OA publisher offers also the service of satisfying the author’s vanity, as the legacy publishers do. 4. Why no Gold OA publisher present itself as a seller of the peer-review service? 5. Why is the peer-review service valuable? – it is also a tool for influencing the opinions of the community, by spinning up some research subjects and downplaying others. Democratic changes in OA can be only reactive. That means one step back with respect to active opposition to change, methodically pursued by interests of a small but powerful minority of big players in the publishing game (i.e. publishers themselves and their academic management friends, sometimes overlapping). And even more, one might say that democratic changes are even two steps back with respect to strategic decisions taken by the said big players. It’s only speculation, but for example the admirable DORA could throw us in the future into the arms of the newly acquired Mendeley. By democratic changes I mean those which are agreed by a significant part of the research community. So, what else? Privately supported changes. By this I mean support of any potentially viral solution for getting us out from this tarpit war. It’s clear that Gold OA is the immediate future change agreed by the big players, although it’s just as useless as the actual research communication system based on traditional publication. Why waste another 10 years on this bad idea, only to repeat afterwards that it is already technically possible to disseminate knowledge without making the authors (or public funding agencies which support those) pay for nothing? The advantage of a new dissemination system is already acknowledged, namely it is far more convenient, economically speaking, to profit from the outcomes of low Coase cost research collaborations, than to keep paying a hand of people who offer an obsolete service and don’t want to adapt to the new world of the net. Wish I have a crystal ball, though I only have some hope. UPDATE: Oh, yeah, maybe the uber-library idea is not the right thing. Yes, everybody wishes for a world library at a click distance, but that’s not all. That’s like “what can we do with cars? Well, let’s make them like coaches, only without the horse. The rich guys will love them.” And boum! the car concept became a success from the moment they were mass-produced. What can we do to create a world where we need to rely less on the bravery of librarians and therefore benefit so much more from it? Yes, graphic lambda calculus has a freedom sector. Which means in that sector you can do anything you like (modulo some garbage, though). It’s yet not clear to me if this means a kind of universality property of graphic lambda calculus. Here, the left and right void circles with the respective arrows represent: the one from the left is a generic out arrow which exits from a gate and the one from the right is a generic in arrow which enters in a gate. For example, look how it’s done for the graph. Technically we define new macros, one for each elementary gate. Let’s call these macros “the free gates”. These free gates define the free sector of the graphic lambda calculus, which consists all graphs made by free gates, along with the move of cutting or gluing arrows. The free sector has inside a copy of the whole graphic lambda calculus, with the condition of adding a local move of elimination of garbage, which is the local move of elimination (goes only one way, not both) of any graph which is not made by free gates with at most, say, 100 arrows + gates. 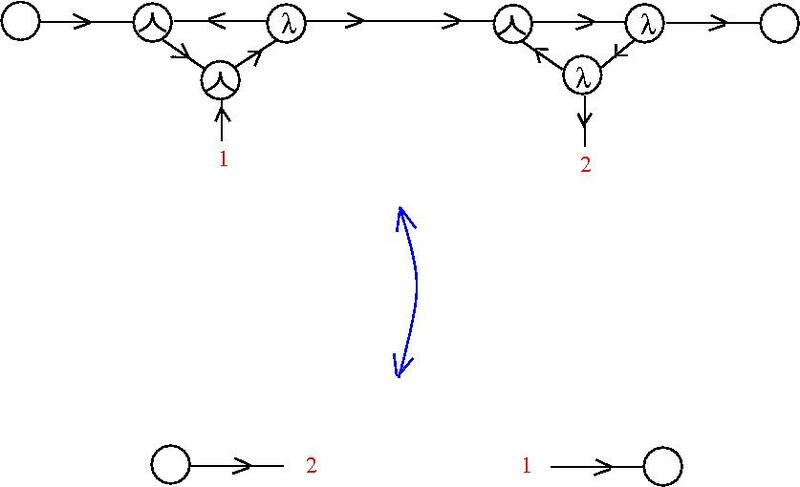 This move is needed, for example, for the case of emulating the graphic beta move with free gates, where we are left with some garbage consisting of one gate and one gate, seen as disconnected graphs.